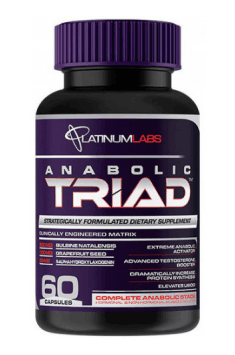 PLATINUM LABS Anabolic Triad is a natural anabolic preparation that raises physiological levels of testosterone. It contains extracts from Bulbine natalensis root and grapefruit seeds, as well as 5a-hydroxy laxogenin. People training in the gym, both competitively and recreationally, are interested in all novelties, which would allow them to quickly increase their muscle mass, or noticeably improve sports results without negative side effects. Anabolic Triad ensures all the above-described effects. The preparation is another edition of the supplement that collects the best reviews among people using it all over the world. Now it is high time we introduced you this proven supplement. Studies on laboratory rats have shown that the use of Bulbine natalensis extracts results in an effect that increases testicular mass, testosterone concentration in the testicles and serum, and an increase in the level of luteinizing hormone (LH) in serum compared to the control group. The evaluation of these parameters provides useful information on the potential anabolic effects of the component discussed. The increase in LH secretion seen during the ingestion of Bulbine natalensis results in increased testosterone production by Leydig cells, which supports the argument indicating the potential anabolic effect of this plant. The increase in the mass of testes observed in the studied animals most probably results from the increase in the functional activity of the organ, including the secretory capacity. The increase in secretory activity of the testes is dependent on androgens, which also indicates the possible anabolic effect of extracts from B. natalensis. 5a-hydroxy laxogenin is a steroidal saponin whose anabolic properties described by people using it are often compared to the effects of oxandrolone, being an iconic steroid. According to the information available, supplementation with 5a-hydroxy laxogenin does not cause any side effects associated with the intake of anabolics, nor does it show hepatotoxicity and may be safely used by women. Apart from the anabolic effect promoting muscle growth, 5a-hydroxy laxogenin may also affect the reduction of cortisol secretion. This applies mainly to people who are intensively training or applying nutritional strategies based on a negative-calorie balance. Due to these unique properties, 5a-hydroxy laxogenin, which is a completely natural substance, may also limit the catabolism of muscle tissue and thus support the regeneration processes taking place within. Grapefruit seed extract contains naringin, which is a substance undergoing endogenous transformation to naringenin with interesting pharmacological properties. Namely, naringenin limits the action of selected liver enzymes involved in the transformation of many chemical substances. As a result, it may enable slowing down the metabolism and elimination of other components of the preparation from the body, which potentially extends and intensifies their action. In summary, PLATINUM LABS Anabolic Triad is a preparation that is recommended to all people who want to improve their figure, including women. In addition to periods of building muscle mass, the supplement can be used as anti-catabolic during the reduction. The product is completely safe and does not cause any undesired side effects. Take 2 Capsules in the morning on an empty stomach. Always take at the same time every day. Besides the typical use, the preparation may be also used to improve sexual performance among men struggling with low libido. Regardless of the intended use, in order to observe the effective activity of the product, it should be used regularly. Since there is no risk of negative effect on the human body, the preparation is suitable for long-term use. Platinum Labs is one of the best supplementation companies, in the offer of which we will find the highest-quality products - each supplement is thoroughly tested for chemical pureness of the extracted chemical ingredients.The products of this producer enjoy trust of the customers all over the world, as their production according to the procedure of their own authorship is in accordance with the Good Manufacturing Practice, which was approved by the Food and Drugs Agency (FDA). The brand also supports IFBB competitors such as Aaron Polites, Alex Faulkner or Allanah Sheehan, therefore it is able to fulfill the needs of each gym adept. Gelatin (capsule), silica, magnesium stearate.